What makes a plant popular for winter landscapes in the snowy regions of the globe? Are conifers the sole contestants? Which landscaping plants are automatically disqualified? Which shrubs are best for attracting wild birds? Answering such questions should help generate landscaping ideas for dealing with that Scrooge of the seasons, horticulturally speaking: winter. Our goal is to turn a drab yard into a winter scene worth painting -- for that matter, worth looking at while you're snow shoveling. While evergreen shrubs (including shrubs with golden foliage) and conifer trees undeniably add visual interest to winter landscapes, so do many other plants, such as red osier dogwoods. About the only plants that are disqualified right at the outset are those that lack any appreciable height: no matter how pretty a plant may be, it will add no visual interest to the winter landscape if it lies buried all winter, dwarfed by a blanket of snow. Based on this premise, let's explore ideas to enhance the winter landscape. And let's keep in mind all the while the fact that many landscaping enthusiasts are also bird watchers; so that a plant's ability to attract wild birds will be a consideration. Red osier dogwood (Cornus sericea 'Allemans') is another extremely hardy plant (zones 3-8). The May flowering of red osier dogwoods yields white blooms that are followed by white fruit. 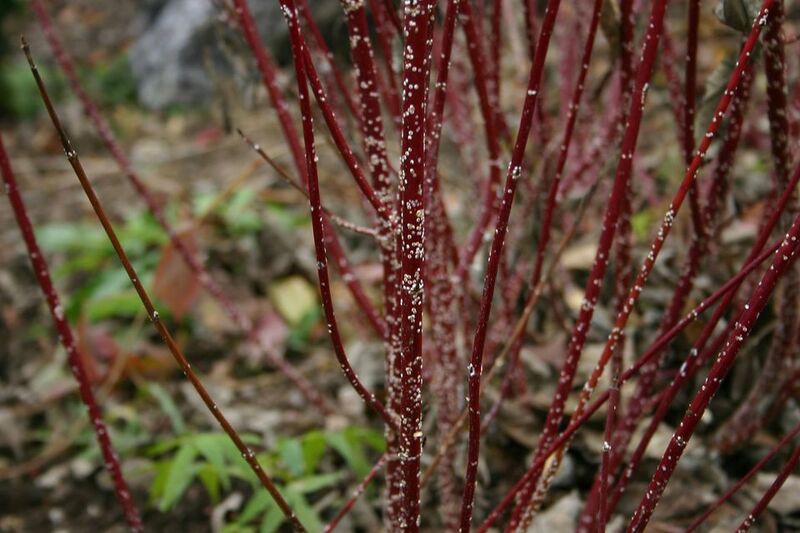 But red osier dogwood makes this list because of its bark, which ranges in color from red to burgundy. Reaching a height of 6'-10', the spread of red osier dogwoods is 5'-10'. A patch of fiery red osier dogwood against a backdrop of pristine snow makes for an unforgettable winter scene. When planning the winter landscape, don't forget to include at least one tall perennial grass. An ornamental grass with a stately, thin shaft and fluffy coiffure exhibits such a delicate structure that it will doubtless lend a touch of charm to any winter landscape, however, barren otherwise. Plume grass (Erianthus ravennae), which can grow to be as tall as 11 feet (by about 4 feet wide), is hardy as far north as zone 4 (for those of you in hotter climates, it is listed for as high as zone 9). Bayberry (Myrica pensylvanica) is a shrub with a spreading habit (4'-6' X 4'-6'), grown in zones 2-8. Its glossy, aromatic foliage complements its waxy, gray fruit. In fact, these unusual berries are widely used to scent candles -- if you can get to the berries before the birds do, that is. It is also a drought tolerant shrub. The birds may like bayberry, but the deer don't, as it's one of the deer-resistant plants. Compact American cranberrybush viburnum (Viburnum trilobum 'Compactum') yields masses of red berries that serve as a source of food for birds on the winter landscape. A rounded shrub, it bears white flowers in May and June that are followed by red fruit. As a bonus, the shrub offers foliage ranging from red to purple in fall. American cranberrybush viburnum is hardy to zone 2. It grows 4'-5' high, with a spread of 3'-4'. Winterberry holly (Ilex verticillata) is a deciduous holly bush indigenous to wetlands in the eastern half of Canada and the U.S. As stated on Page 1, usefulness for attracting wild birds in winter is one of the criteria considered for this list, and the fruit of winterberry (see photo at right) will certainly attract birds to your property. Far from being a drawback, its deciduous nature is actually a benefit for the winter landscape. Why would you want leaves to be in the way when you have such gorgeous berries to behold? A dioecious shrub (as are bayberry and evergreen holly), to ensure fruit production it is best to plant several shrubs together, to increase your chances of finding a male plant to accompany the females. For a full-length feature on this shrub, please consult Brighten the Winter Landscape With Winterberry Holly. Yews are renowned for being plants in our Christmas traditions. These conifers bear evergreen needles and bright red berries. But keep children away from both the foliage and the berries of these poisonous plants; the seeds and needles are quite toxic. Please consult my full-length article for more information on yew shrubs. Are you surprised to see eastern hemlock trees (Tsuga canadenesis) included in a list of landscaping plants? You may think of them first and foremost as tall trees (60' or more) that you encounter out in the woods. But plant developers have bred cultivars that are more shrub-like, which are well-suited for use in hedges, etc. Shear them to keep them at the desired height. Whether used in hedges or as specimens, these evergreen conifers will help give your winter landscape some much-needed visual interest. Like winterberry holly, Viking black chokeberry (Aronia melanocarpa 'Viking') tolerates poorly-drained soils. Like American cranberrybush viburnum (see Page 1) and barberry (see Page 3), this shrub provides foliage that ranges from red to purple in fall, making it a two-season standout. Viking black chokeberry is hardy to zone 3. As with all the berries mentioned in this article, chokeberry berries serve as an emergency food for wild birds. They're not the birds' first choice (they are astringent or otherwise unpalatable, which is why they stick around so long!). But when the birds get desperate, these plants are their salvation. Its white flowers in May yield to purplish black berry clusters. It grows to a height of 3'-5', with a spread of 3'-5'. The final two shrubs didn't make my Top 10 list. I mention them simply because they used to be popular for providing winter scenes in the yard: Japanese barberry shrubs and winged euonymus shrubs. Both, however, are invasive plants, so seek alternative components for your winter scenes where possible. Japanese barberry (Berberis thunbergii) is a rounded shrub with thorns, hardy to zone 3. It ranges between 4' and 6' both in height and spread. Its leaves put on a color show in autumn, changing to orange, then to reddish purple. Small yellow flowers in spring are succeeded by oval, red berries. These fruits last well into winter, thus serving not only as components for winter scenes, but also as a source of food for wild birds. As an alternative, try cotoneaster plants. Winged euonymus (Euonymus alatus), also called "burning bush" (height 10'-15', spread 10'-15'), is grown in zones 4-8. For the purposes of winter scenes, the common name, "winged euonymus" is apropos. Indeed, the Latin, alatus, does translate to "winged." But in addition, it is the "wing" or corky flap of bark running along the edges of its stems that is responsible for this plant's popularity for winter scenes. Because of this corky protrusion, winged euonymus catches and holds snow more readily than most plants (see photo, above right), affording glimpses of sparkling winter scenes. Other kinds of euonymus lend themselves to winter scenes for a different reason: namely, they bear evergreen foliage. For example, 'Emerald Gaiety' euonymus can be coaxed up a post, where its variegated, evergreen leaves will be visible all winter. They pick up pink highlights during Old Man Winter's tenure that make them even prettier. The designation, "burning bush" for this invasive shrub is more appropriate in autumn, when the bush's dazzling red foliage does virtually set the landscape "on fire." As a fall-color alternative, try Virginia sweetspire. For information on other shrubs popular for fall landscaping, please consult Shrubs and Vines for Fall Color.